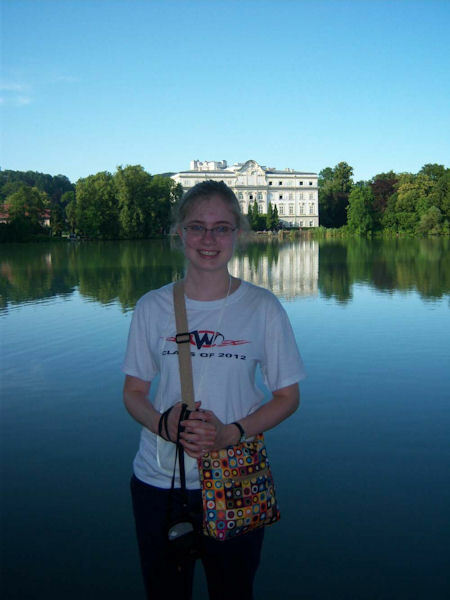 Kristen Enjoys European Tour With Honor Band - "The Sound Of America"
Being selected to go on a 23 day European tour with the honor band, "The Sound of America", is quite a prestigious honor. It's an honor that West Central's Kristen Rankin received earlier this summer. This year was the bands 34th tour through Europe, with the group performing eleven concerts in six different countries. Kristen met with The Sound of American for the first time on July 2. She recalls that there were about 150 kids from 39 states throughout the US, and even a few from China. They met as strangers, but left as friends. The first stop on the map was Germany. Kristen loved picnicking in the gardens at Rothenburg and eating the native foods. One of the memories that stands out the most is when she and her friends tried to cut a large loaf of bread with a dagger. Apparently, daggers do not cut through bread very well. A favorite in Austria was the Alpine slide. The slide is not actually a typical slide, what you really do is slide down the mountain on a wheeled toboggan! The group also visited the area where the "Do-Re-Mi" scene from The Sound of Music was filmed. Next stop: Venice. From the top of bell towers to gondola rides in the channels, it was a very memorable time. Kristen says that Venice really is sinking, her tour guide explained to them that in certain seasons they are required to take the gondola (a small boat shaped like a canoe) across St. Mark's Square. In Verona, Kristen and her new friends visited a coliseum and listened to a choir sing. They then went on to the famed balcony of Juliet. The Swiss Alps were very exciting for Kristen, especially when she went on a zip line through the mountains! She said that it was hard to breathe with so much wind, but it was still lots of fun. Kristen's favorite thing about France was the Notre Dame Cathedral. They watched the choir perform there and then took a tour around Paris. They performed that night in a little church just outside of Paris and was greatly appreciated by all who heard them. In the words of Kristen, "The following day they let us loose in Paris!" She went back to the Notre Dame Cathedral hoping to see the bell tower, but there was such a long line she decided against it. Instead, she and a friend chose to wander around the small shops, listen to musicians on the street, and try her first crepe. After their afternoon of freedom, the group sang in the Luxembourg-American Cemetery. They sang Latin Hymns and "Shenandoah" while the trumpeters played TAPS. July 24 the weary travelers finally landed in the JFK airport in New York. Being without her parents for nearly a month taught Kristen to be more independent and learn the importance of organization. "Having a designated place for everything saves everyone a lot of stress," she says. All in all, it was an experience Kristen felt honored to have had. West Central's Kristen Rankin of Raritan tells of tour.